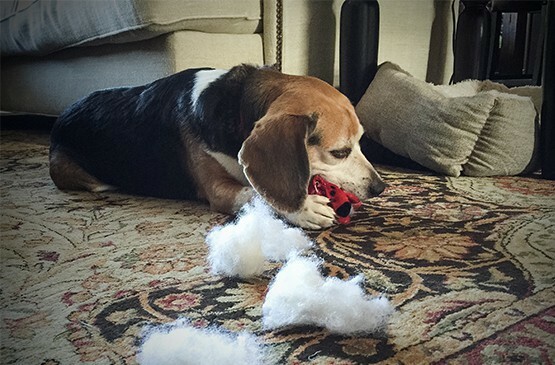 Often it is hard to tell whether your dog is destroying the house while you are out because he is bored and lonely or whether there is an underlying problem caused by severe stress and anxiety about being left on his own. Separation anxiety is rare but very distressing for the dog and owner. Symptoms include whining and pacing as you prepare to leave, dilated pupils, panting and drooling, house soiling, howling and barking once you’ve left and the destruction of door and window frames. On the other hand if the symptoms include barking, destruction of furniture, cushions and dog beds and stealing food items from bins or worktops then it’s more likely to be boredom – coupled with an incomplete house training if you come home to find little ‘gifts’. As you can see, it isn’t always clear! If your dog seems unconcerned as you prepare to leave and shows interest in a small amount of food scattered on the floor then it’s probably boredom. If your dog is obviously under severe stress that visibly increases as you get closer to leaving then it’s more likely to be separation anxiety. Separation anxiety will need to be diagnosed and treated with an individual treatment plan by a behaviourist, via your vet. Fortunately, loneliness and boredom can be dealt with more easily and there’s a lot you can do to alleviate it, even if you’re regularly away from the house. If your hound is also eliminating in the house then you’ll need to re-address his house training and confine him to a small non-carpeted area, such as the kitchen, while you sort it out. It may be that your hound isn’t getting enough stimulation during the day which means he has extra energy to burn off and so he’ll entertain himself by chewing the cushions and barking at passers by out of the window. This is especially likely if your hound is under three years old. Increasing the amount of exercise he’s getting on a daily basis will normally help and finding an agility or other training club will give you an evening of bonding and entertainment for you both. Another great way to fill in some time is by providing hollow food-filled toys which you may like to give when you’re leaving him alone in the house. If you can entertain a dog for the first 20 minutes after you leave then he has a much greater chance of settling quietly. Check weekly that your Beagle’s ears are clean and get your hound used to having its teeth inspected. Some hounds, especially those who do not get much exercise on hard surfaces, grow rather long toenails, so pay attention to them by clipping the tip off or by filing, otherwise you will need to get your Vet’s help. These are odd shaped hollow rubber toys that can be stuffed with food and, with a bit of practice, can provide good quality entertainment for a dog on his own for half an hour or more. Be careful if you’ve more than one hound, as disputes could arise over ownership! 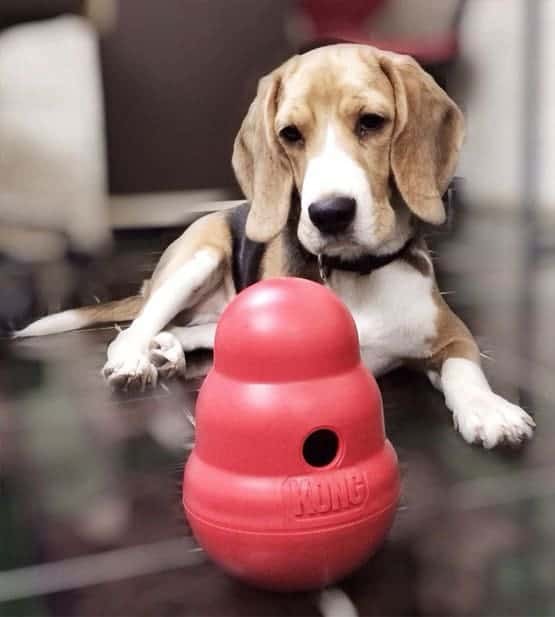 Kongs come in a range of sizes and are available at most pet shops. You should make sure any food you do use is taken off your Beagle’s daily calorie allowance, since Beagles are very prone to putting on weight. When first introducing a Kong toy to a dog, you should make it fairly easy for the dog to get at the food. Once he’s hooked then the trickier you can make it to empty, the more entertainment it will provide. Iced biscuits – Fill a Kong with dried food then place it in a bowl of warm water until the biscuit has gone soft. Next, simply pop it in the freezer overnight to provide a long lasting, cooling summer snack. Cheese sandwich – Alternate a squirt from a tube of low fat cheese spread with a small hard dog biscuit until you can’t force any more into the Kong. Buster cube – Other toys, such as a Buster Cube, dispense dried food as they’re pushed around the floor and can also provide lots of entertainment. Do make sure that you’re not over feeding by taking the dried food equivalent from your hound’s daily allowance. inally, remember that however entertaining these toys can be, they’re still no substitute for company. If you’re leaving your Beagle alone for more than four hours at a time then you’ll need to arrange a dog walker or a sitter to make sure his welfare is not compromised.